Alpine air smacks my cheeks as I step onto the tarmac. A curtain of blue-grey mountains encircles the airport and I’m suddenly aware: this is a majestic land. It’s my first time in New Zealand and the start of a one-week encounter that leaves me longing for more time to roam the captivating wilderness of the South Island. Soon we are driving down towards Queenstown. It sits so pretty beside the lake, protected by peaks and lapped by a tranquil blue. The first of many photo stops reminds me of the icy chill outside, and I’m giddy to see surrounding slopes spotted with snow. 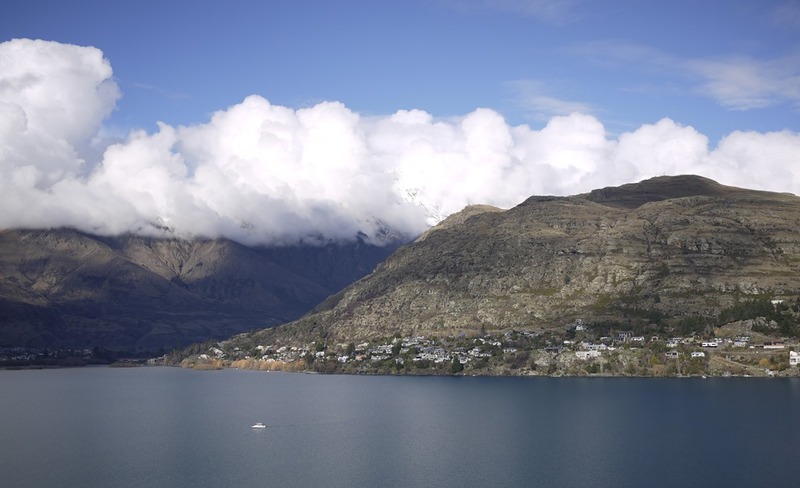 I quickly realise that Queenstown shares many similarities with other ski-towns. A handful of languages brush my ears as I walk the paved arcade noting the mix of tourism offices, international brands and local shops along the way. But the provincial charm is not lost in this nomad beacon. Boats bob gently by the pier and locals greet you with a warm hello. After a quick bite, we’ve recovered some warmth and are already leaving dear Queenstown. We planned to stay for a few nights in nearby Wanaka, another lakeside town famous for it’s stunning scenery, before returning for a closer look. Frankton Airport services Queenstown. It is relatively small for an international port but still has a small selection of duty free alcohol and perfumes on sale, and a sizeable hire car hub. The airport is 6km from Queenstown. Vudu Cafe is a cosy stop for some coffee and cake or a sandwich. Like most New Zealand eateries, it has gluten-free options. Find it in the centre of Queenstown, in Beach Street. I was told by a couple of locals that parking in Queenstown centre is a ‘nightmare’, but each time we arrived with our hire car, we found a spot within a block of the central district. Driving in from the airport, you’ll find a big car park on your right-hand side as you reach the centre. It’s paid but cheap, and if you arrive early in the morning, available for 8 hours at a time. Happy to help. Enjoy your trip! way, great website and I look forward to seeing it grow over time.